The present invention generally relates to a method and apparatus for compensating for DC-offset when receiving signals in a radio receiver. More specifically, the present invention proposes a method and apparatus for compensating for DC-offset introduced in the radio receiver in.such a way that the DC-offset estimation and channel estimation are separated, and that any bias in the DC-offset estimation due to the transmitted symbols is compensated for in a channel estimator and in an equalizer. In digital communications systems, transmission signals are produced by the modulation of a carrier signal with digital data to be transmitted. The digital data is commonly transmitted in bursts where each burst consists of a number of data bits. When the transmitted signal is received, the signal requires demodulation in order to recover the data. Radio receiver architectures commonly employ direct conversion (i.e., homodyne) receivers to perform the demodulation of a received signal. A local oscillator operating at the carrier frequency is used to mix down the received signal to produce in-phase (I) and quadrature (Q) baseband signals. Direct conversion receivers are very efficient in terms of both cost and current consumption. The motivation behind the direct conversion receiver is to have the incoming carrier directly converted down to baseband, in both I and Q components, without use of any IF frequencies. However, direct conversion receivers also have drawbacks. For example, a DC-offset can be introduced to the DC level of received signal. A DC-offset arises from mainly three sources: (1) transistor mismatch in the signal path, (2) local oscillator signal leaking and self-downconverting to DC through the mixer, and (3) a large near-channel interferer leaking into the local oscillator and self-downconverting to DC. As a result, a signal that is received from a transmitter can be further distorted, and thereby lead to inaccurate data decoding. Additionally, the DC-offset can be several decibels (dB) larger than the information signal, requiring the DC-offset to be compensated for in order to be able to recover the transmitted data in the decoder. WO 98/25351 discloses a method for calculating an impulse response in a receiver, whereby the impulse response is calculated prior to any DC-offset being removed. The simple and most immediate way to compensate for the DC-offset is to estimate the mean value of the received burst, subtract the estimate from the received signal and then feed the signal to the decoder. GB 2,267,629 discloses such a system. However, the estimate introduces a bias DC offset, due to the finite amount of data used for estimating the DC-offset. The bias DC offset can be so large that the bit error rate of the receiver does not decrease as the signal-to-noise ratio increases. As a result, the bias DC offset will determine the minimum amount of noise (i.e., the noise floor) that is combined with the data within the receiver. Furthermore, since the transmitted data is unknown, it is impossible to compensate for the bias DC offset in the signal before it is supplied to the decoder unless a large amount of data is received (in which the bias DC offset will be reduced to zero) or both the transmitted symbols and the channel are known. A way to overcome this problem is to compensate the DC level in the decoder. However, while this solves the bias DC offset problem, the dynamics in the decoder will be too large because the DC-offset level can be several decibels (dB) larger than the received signal. Also, numerical problems are encountered when estimating the radio channel and the DC-offset simultaneously because of the magnitude difference between the channel parameters and the DC component. Therefore, there is a need for methods and apparatuses that separate the mean value estimation and channel estimation tasks and that also compensate for the bias DC offset introduced by the transmitted sequence. To remedy the problems encountered in conventional DC-offset compensation techniques, the present invention provides the ability to separate mean value estimation and channel estimation and the ability to compensate for bias DC offset introduced by the transmitted sequence. In according with one aspect of the present invention, there is provided a method for compensating for DC-offset in a receiver comprising the steps of: receiving a transmitted signal burst at said receiver; downconverting said signal burst into a first set of baseband component values; finding a known training sequence in the first set of baseband component values; characterised by the steps of: estimating a DC-offset value using said known training sequence; subtracting said DC-offset value from said first set of baseband component values to obtain a second set of baseband component values; performing channel estimation using said second set of baseband component values and outputting a channel model and a bias DC-offset value, and performing equalization of said second set of baseband component values using said second set of baseband component values, said estimated channel model and said bias DC offset value. Additionally, in accordance with another aspect of the present invention, there is provided an apparatus for compensating for DC-offset in a receiver comprising: means for receiving a transmitted signal burst at said receiver; means for downconverting said signal burst into a first set of baseband component values; means for locating a known training sequence in the first set of baseband component values; characterised by: means for estimating a DC-offset value using said known training sequence; means for subtracting said DC-offset value from said first set of baseband component values to obtain a second set of baseband component values; means for performing channel estimation using said second set of baseband component values and outputting a channel model and a bias DC-offset value, and means for performing equalization of said second set of baseband component values using said second set of baseband component values, said estimated channel model and said bias DC-offset value. Figures 5A, 5B and 5C are diagrams of a typical TDMA burst, and DC steps that occur during a data sequence and during a training sequence of a typical TDMA burst in accordance with an exemplary embodiment of the present invention. The present invention will now be described with reference to the accompanying drawings, in which various exemplary embodiments of the invention are shown. However, this invention may be embodied in many different forms and should not be construed as limited to the specific embodiments shown. For example, while the present invention is described in a time division multiple access (TDMA) environment utilizing homodyne receivers, it could also be employed in other access environments and with other types of receivers where any type of channel estimator and equalization method can be used in digital communication. Figure 1 depicts a conventional homodyne receiver 100 which can be employed within mobile communication systems to receive data bursts. As illustrated in Figure 1, antenna 105 receives a burst of data and sends the received burst to first filter 110. The first filter 110 can be a bandpass filter which is designed to pass only the desired frequency band (for example, the GSM frequency band). Once filtered, the signal is sent to a first amplifier 120. The first amplifier can be a low noise amplifier. The signal is then down converted to baseband in-phase (I) and quadrature phase (Q) signals by means of respective first and second mixers 130 and 160. The first and second mixers 130 and 160 are each controlled by a local oscillator 175. A first output of the local oscillator 175 is coupled to an output of the first mixer 130, and a second output of the local oscillator 175, having the same frequency and 90 degrees out of phase with the first output, is coupled to the second mixer 160. The local oscillator 175 is set to the carrier frequency of the wanted signal. The signals output from the first and second mixers 130 and 160 are sent to filters 140 and 170, respectively. Filters 140 and 170 can be low pass filters which are employed in order to remove transient signals from the baseband I and Q signals. The filtered in-phase and quadrature signals are digitized by A/D converters 150 and 180, respectively. Outputs of the analog-to-digital converters 150 and 180 are next sent to respective filters 155 and 165. The output of filters 155 and 165 are sent to a signal processor 190 for signal processing and recovery of the transmitted information. Figure 2 shows a block diagram of a DC-offset compensation apparatus 200 in accordance with an exemplary embodiment of the present invention. The DC-offset compensation apparatus 200 is located in the signal processor 190 of Figure 1, and is employed to compensate for DC-offset introduced by the receiver. U = [d i , d i-1,...,d i-L ] is a vector of transmitted symbols, and ei represents noise. is also sent to a synchronization unit 220. Synchronization information can be determined by correlating the received data stream to a training sequence, d i:TS , known to be included in the burst. In determining synchronization information, the synchronization unit 220 finds the best match between the training sequence and the received signal and determines the position of the received samples in the burst that represent the training sequence. where U j:TS = [d j:TS ,...,d j-L:TS ] T is the j:th vector of length L + 1 which only consists of pilot symbols d j:TS ,(i.e., known data). The difference between the model used in the channel estimator 240 in accordance with an exemplary embodiment of the present invention and the classical channel model, is that the input sequence U j:TS - U TS is used instead of U j:TS , thereby compensating for the bias DC offset introduced by the modulation. Furthermore, note that this will be the best compensation able to be performed since in the noise free case (i.e., Var(e i ) = 0) equations (7) and (8) are perfectly matched, thereby indicating that H and → H when Var(e i ) → 0. Thus, in the noise free case perfect channel estimates can be obtained. where N is the number of information symbols in the burst. As can be seen from (7) and (9), by including the extra term R and DC = H and T U TS as shown in equation (9), the metric used in the equalizer 250 will be the same as the metric commonly used in classical MLSE equalizers for signals with no DC component. Thus, by using the channel estimator 240 and equalizer 250 presented above, the DC-offset component will not determine the minimum amount of noise (i.e., the noise floor) in the receiver. In accordance with another exemplary embodiment of the present invention, compensation can be performed to accommodate for magnitude changes (a DC step) in the DC level of a received signal. A DC step can occur in a received signal when, for example, a strong nearby interferer ramps up its output signal. In the DC offset compensation apparatus 300 illustrated in Figure 3, the baseband signal of a received burst is stored in buffer 210 and also is sent to a synchronization unit 220. The synchronization unit 220 locates the training sequence within the received data burst and supplies this synchronization information to the channel estimator 240. The data sequence values are fed to an offset change detection unit 310. The change detection unit 310 determines where changes in the DC-offset have occurred within a received burst of data.
) 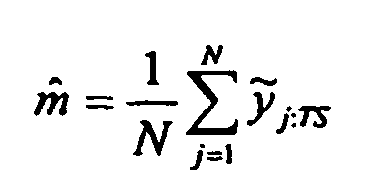 is the estimated power of y i , and α is a predefined threshold. The estimated power is determined in the threshold detector 420. The predefined threshold is a peak voltage value chosen based upon the particular application. If, for example, the receiver requires high accuracy for an application, the threshold will be small. If |x i |/Pow( y i ) is greater than α, then a DC step is determined to have.occurred at position i. Alternatively, the signal x i can be low pass filtered rather than being differentiated by a differentiator, before being compared to the predetermined threshold. Referring back now to Figure 3, the received sequence, y i , together with position information (i.e., the time instants where DC steps are found) are both fed to the DC offset estimator 260 that estimates (n + 1) DC offsets, m and k (where n is the number of detected DC changes in the burst). The estimated DC offsets m and k , where k = 1, ..., n + 1, are fed to a control unit 320. The control unit 320 ensures that the DC offset estimates are subtracted from the received burst, y i , in synchronism. This calculation will result in an uncompensated bias DC offset for this part of the received signal because no known signals (i.e. training sequence) can be used when estimating. where N is end of the training sequence of the burst. Thus, each half burst is treated independently and a correction value is determined in the same way as described above for each half burst (m and 1, m and 2), and subtracted, and the residual DC for each burst is compensated for in the channel estimator 240 and equalizer 250.
where U j:TS = U 1:N 1-1.TS , j = 1, ... N 1 - 1 is the mean value vector of the training sequence from time 1 to N 1, - 1 and U j:TS = U N 1:N.TS , j = N 1, ..., N is the mean value vector of the training sequence from time N 1 to N.
While the present invention has been described with respect to its preferred embodiment, those skilled in the art will recognize that the present invention is not limited to the specific embodiment described and illustrated herein. Different embodiments and adaptations besides those shown herein and described as well as many variations, modifications and equivalent arrangements will now be apparent or will be reasonably suggested by the foregoing specification and drawings without departing from the substance of the scope of the invention. performing equalization of said second set of baseband component values using said second set of baseband component values, said estimated channel model and said bias DC-offset value. The method of claim 1, wherein said first set of baseband component values are digitized signals. The method of claim 1, wherein said first set of baseband component values are in-phase and quadrature components of said received signal. is a j:th vector of L+1 of the pilot symbols and L is the number of corresponding taps. where H is a channel model, U is a reference training sequence, and N is the number of pilot symbols from the training sequence. determining the location of at least one DC step value within said received baseband signal. determining whether the differentiated baseband component values exceed a predetermined threshold value. controlling the subtraction of said DC offset estimates from said received signal to ensure data synchronism between the estimated DC offset values and said first set of baseband components. The method of claim 6, wherein if said DC step occurs within a training sequence of said transmitted sequence, the estimating step is performed independently over a part of the received message affected by said DC step and over a part of the message not affected by the DC step. is the kth vector of the received burst. means (250) for performing equalization of said second set of baseband component values using said second set of baseband component values, said estimated channel model and said bias DC-offset value. The apparatus of claim 11, wherein said first set of baseband signal components are digital signals. The apparatus of claim 11, wherein said first set of baseband component values are in-phase and quadrature components of said received signal. is a j:th vector of L+1 of the pilot symbols, and where L is the number of corresponding taps. means (310) for determining the location of at least one DC step value within said received baseband signal. means (420) for determining whether the differentiated baseband component values exceed a predetermined threshold value. means for controlling the subtraction of said DC offset estimates from said received signal to ensure data synchronism between the estimated DC offset values and said first set of baseband components. The apparatus of claim 16, wherein the means for estimating a DC-offset value is configured such that, if a DC step occurs within a training sequence of said transmitted sequence, an estimating step is performed independently over a part of the received message affected by the DC step and over a part of the message not affected by the DC step. where B is the number of bits in a burst, i 0 is the time of occurrence of the DC step and y and k is the kth vector of the received burst.